Mounted scope on a hunting crossbow – sits pretty and ready to go. Hunting with a crossbow is not only exhilarating, it can also be quite rewarding as well. However without a proper scope hitting your target from a distance is pretty much impossible for all but the most skilled and experienced of marksmen. Let’s face it. There isn’t a hunter out there that doesn’t want to be successful and shoot with both skill and accuracy, and there’s a reason that scopes have been popular and continue to be so: they increase that all important accuracy. This is why it’s so important that you find a scope that’s right for your personal preferences in addition to your hunting needs. 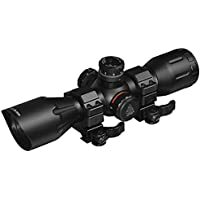 The crossbow scopes listed below are all high-quality devices each unique in their own way but stand out at a level that makes them worthy of our top rated list here. Check them out and find one that’ll help you take your game to the next level. Nikon 8461 Bolt XR Crossbow Scope Our top rated hunting crossbow scope, an outstanding option from a trusted brand. 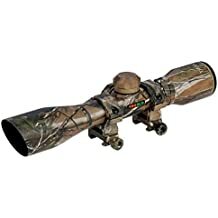 TRUGLO Crossbow Scope 4X32 Excellent crossbow scope with camo aesthetic perfect for hunters. UTG 4X32 Crossbow Scope Thick black scope that will help you really hone in on the prey. Black TRUGLO Compact Crossbow Compact crossbow scope perfect for the weight conscious hunter. Ultimate Arms Gear Illuminated Crossbow Hunting Tactical Scope Red and green illumination scope. The multicoated lenses on this scope are really amazing. These lenses have a coating that reduces bright, high-contrast light and glare by up to 92%. Nothing ruins a perfect shot more than the inability to see, and when you use the Nikon 8461, that just won’t be a problem. You’ll notice your accuracy increase the minute you start shooting with this scope. The zero-reset turrets incorporated into this device are also another impressive feature. These turrets give you the ability to make in-field adjustments quickly and with no effort at all. You’ll be able to adjust your sight at 20 yards and then readjust it back to zero by simply using the handy little knob on the side of the device. Setup really can be that simple. If you’re someone who enjoys hunting in adverse weather conditions, then you’ll also be happy to know that this crossbow scope is waterproof, fog proof, and even shockproof. You’ll never have to worry about this scope becoming rusted or corroded when you use it in wet or damp environments. I highly recommend the Nikon to any serious hunter. It can be attached to just about any kind of model you own, and its lightweight design won’t weigh your crossbow down. Every purchase comes with a set of lens caps, a set of elevation caps, and for your own comfort, a no-fault repair and replacement warranty too. This crossbow scope manufactured by TRUGLO is one useful accessory. For starters, the device features a special range finding and a trajectory compensating reticle which allow you to easily calculate your shots for maximum accuracy. The 4″ eye relief in addition to the rubber eye guard make shooting your bow an extremely comfortable experience. To help increase the accuracy of your shots, both of the lenses are coated with a special compound. This compound increases the quality of the lighting, improves the contrast, and even maximizes the clarity. Once you use this scope, you’ll never want to use anything else again. The accuracy of this crossbow scope is seriously that good. Adjusting the windage and the elevation is also a treat. It’s not only a quick process, it’s extremely accurate. No matter what kind of conditions you’re shooting in, you’ll always be able to hit your target dead on. The precision you’ll experience when you shoot with this scope is simply jaw dropping. Although accuracy is important, the construction of the device is also extremely significant as well. Nobody wants to invest in a product that’s going to fall apart in a few months, and that’s not what you’re getting here. This crossbow scope is made from durable aluminum, is both scratch resistant and shock proof, and comes with a lifetime warranty. This is definitely one high-quality crossbow accessory. This is an absolutely exceptional crossbow scope that will have you more accurately honing on your prey during hunting season in no time. Among many experienced crossbow hunters, the UTG 4X32 is considered one truly magnificent device. 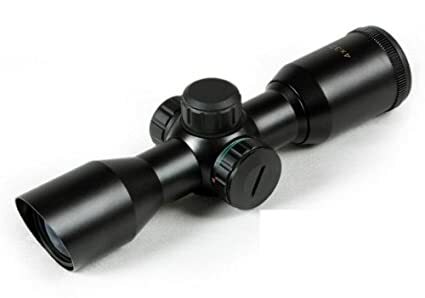 This scope has a parallax of 50 yards, utilizes a TS platform, and features two convenient nobs for adjusting both the elevation and the windage. You can even lock your preferred adjustments into place and reset it back to zero with the push of a button. To take your accuracy to the next level, UTG also incorporated top-of-the-line broadband lens coating and a 5-step reticle. The body of this scope is constructed from a real durable aluminum that’s sleek, lightweight, and designed to withstand even the harshest environments. It doesn’t matter if you’re hunting in the rain, the snow, or the cold. This scope will never rust or corrode, and you’ll get top notch performance year after year. You’ll definitely find this scope a delight to use. The flip-open lens are extremely convenient and feature UTG RQ2W1104 QD Rings. 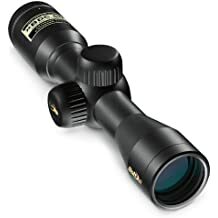 This is truly a fantastic choice for any hunter interested a premium scope for a really affordable price. This trajectory compensating reticle features a special range finder will precisely calculate the distance between you and your target. You’ll get an accurate shot every time you pull that trigger. You’ll also find the 4″ eye relief and the coated lenses to be very comfortable and easy to use. The coated lenses are designed to increase clarity, brightness, and overall contrast to deliver superior accuracy. Other features that I really love include the placement of the windage and the elevation adjustments. These adjustments are conveniently located just under the screw down caps and are really convenient. They couldn’t have been placed in a better location, and once you use this scope, I’m sure you’ll agree with me. The TRUGLO crossbow scope is constructed from top of the line aluminum and will not scratch, break, or crack when dropped or used in extreme weather conditions. If something should ever happen to your scope, the lifetime warranty will cover it. This is definitely a scope you won’t regret buying. Give it a try and see for yourself as your next hunting season becomes all the more successful. The most impressive features on the Ultimate Arms Gear are the two 32mm lens. They’re clear, vibrant, and have a fixed magnification of 4X. In addition to this, the rangefinder reticle will also give you the ability to quickly and accurately calculate the distance between you and your target. With the windage and elevation adjustments, you’ll be able to fine-tune your shot to ensure you always shoot precisely as possible. Those extra inches make all the difference when it comes to getting that perfect shot (especially long range) during hunting season. The durability of this hunting crossbow scope is something that you’ll really appreciate as well. The top notch design means this will survive drops, use in extreme cold temperatures, or being dropped in water. No matter what the scenario, this premium hunting scope is built to last through any amount of use. This particular scope is built to last and take lots of abuse. If you’re looking for an all-around great scope for a price that won’t break your wallet, this is a scope you should really check out. Q: Are hunting crossbow scopes basically interchangeable? A: Yes and no. These scopes are not one size fits all. After all, different crossbows are going to be different sizes and that means you will need different sized scopes, as well. Q: I thought I heard some weird thing about crossbows being made illegal by the Pope, or did I just make this up? A: First of all if you’re actually asking this – good on you as a history fanatic! The crossbow has a really interesting history, and it is true that back in the times of early Medieval warfare the crossbow was seen as too violent and brutal as a combat weapon, so the Pope of the time banned its use in battle. But no one really listened. Obviously today modern crossbows use that extra torque for hunting game, not attacking people, but this is an interesting historical tidbit on the old military crossbows of history. Q: I’ve heard crossbow hunting is illegal – is this true? A: Generally speaking crossbow hunting is legal in the United States and Canada, however crossbow hunting is very much regulated. In some states it is legal during bow season, in others only during firearms season, and there are other places where it is only legal during certain times and for certain types of animals, and in a couple states only disabled hunters can get a crossbow permit for hunting season. You always want to check with local regulations to see about any additional restrictions in the area. Q: Which states allow crossbow hunting? A: Virtually all of them in some way, shape, and form although in many states there are restrictions on the who, what, where, and when of how they can be used. Q: Where can I find more information about crossbow hunting regulations in the United States? A: A great resource for all potential hunters is the NACF page for crossbow hunting regulations in North America, which really breaks down state by state what the current rules and regulations are. Q: When is crossbow hunting season? A: Once again this varies depending on what state you are hunting in. In many states crossbow hunting season coincides with deer season, bow season, or deer season with firearms (although rarely all of them). Q: Who makes the best hunting crossbow or crossbow scope? A: Obviously this can vary to some extent depending on preference and how well each hunter adapts to his or her weapons. We’ve obviously brought out our picks for the best crossbow scopes currently on the market but crossbow will be much more of a personal preference, though we give some options based on TMC’s “The Walking Dead” and our article on Daryl Dixon Crossbows. Q: How will crossbows continue to evolve? While a crossbow scope can be a relatively new concept for those of us who aren’t nearly as familiar with shooting or hunting crossbows as firearms or bows, there are several great options available and a dedicated community that can help you adjust to learning how these scopes work, how to adjust them, and how to make sure you get the proper setup so you can make the absolute most of your hunting excursions.